Today, Bob Marley would have turned 67 years old. There will be several events around the world marking the reggae legend’s birthday. In December 1976, Marley was involved in a tragic incident in which he, his wife Rita, manager Don Taylor, and a friend, were shot at his Hope Road home. Reporter Leslie Miles, then working with the Daily News, was at the house that evening. He recounts the episode in an interview with the Observer’s reporter Basil Walters last week. ON December 3, 1976, two days before the ‘Smile Jamaica’ concert organised by Prime Minister Michael Manley, tragedy struck in the country’s capital. 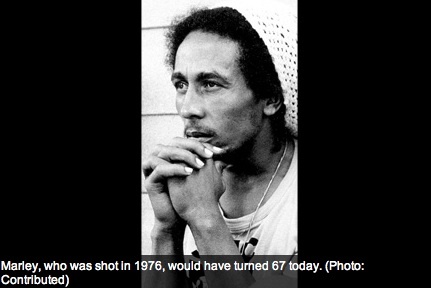 Reggae star Bob Marley, main act for the Heroes Circle event, was shot at his Hope Road home.